An in-law unit can be a major selling point when you’re buying a house. It’s the perfect guesthouse for short-term visits (your adult children coming for Christmas) or long-term stays (Grandma moving in with you). But what can you do with your in-law unit while it’s sitting empty? Some homeowners opt to rent it out. Nothing sounds sweeter than extra monthly cash flow, but is it really that simple? Let’s dive into the pros and cons of renting out your in-law unit and what you can expect to deal with as a property manager. “This can usually be done by calling your local housing authority or city,” Trevizo says. 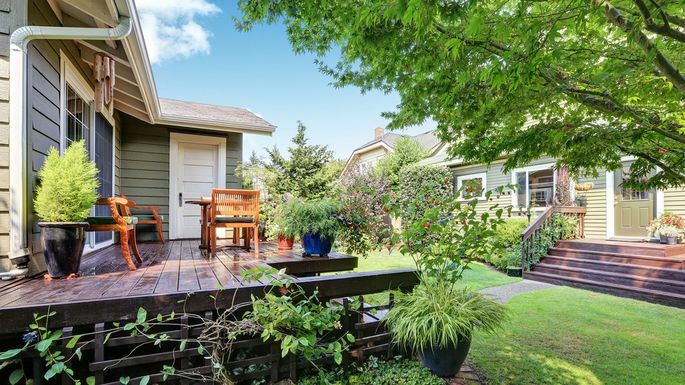 As Trevizo points out, homeowners stand to make extra income with a space they’re not already using, and they can do so with relatively little intrusion on their everyday lives. Because of their separate entrance, in-law units offer homeowners privacy and a sense of distance from their renters, something that wouldn’t happen if you were renting out a room in your home. In-law units are also attractive to renters, which can make it easier for you to find a tenant. Because an in-law unit is part of a home, it’s likely located in a community largely made up of single-family homes. What’s more, if you’ve already furnished your in-law unit for visits from your guests, you have the advantage of being able to list it as a furnished unit for short-term rental on sites such as Airbnb or HomeAway. Then again, the separate entrance and all-in-one amenities (e.g., private bathroom and kitchen) make most in-law units great for extended-stay rentals as well, says Rob Stephens, co-founder and general manager of Avalara MyLodgeTax, a company that provides lodging tax compliance solutions for property managers. If you know the unit will sit vacant for a while, an in-law unit can be turned into a more traditional rental, with long-term monthly or even yearly leases. Before renting out your in-law unit, you must ask yourself if you’re ready to deal with a tenant in your personal space. Separate entrance and bathroom aside, the tenant will still be living on your property, so you’re both certainly going to have some personal interaction at some point. There are also a few other questions to consider, says Kimberly Smith, a broker with AvenueWest Global Franchise, in Denver. For example, will the tenants’ noise bother you or your noise bother them? Will you feel safe? Are you comfortable renting to someone with a pet? Do you have enough room for them to park their car, or will that require daily communication? Because renting out an in-law unit is legally equivalent to renting out any other piece of property, you do need to follow the laws of your local municipality, Stephens says. In the case of a short-term rental such as an Airbnb, you may be required to collect occupancy taxes, register guests, and sometimes obtain a license from your local authorities. In other words, you’ll need to check with the city, county, and state where your home is located before you decide to become a landlord, even if it’s for the short term. Renting out your in-law unit could also have an effect on your homeowner insurance policy, so it’s important to call your insurance agent before you put up that rental ad. Because renting is defined as a business activity, your typical homeowner policy will not cover losses related to your rental, Stephens warns. One final consideration, and this is a big one: the responsibility that comes with maintaining a property. “This could mean late-night phone calls about problems the tenants are having with the home,” Trevizo warns. As the property manager, you’ll be on the hook for a number of things, including collecting rent, setting lease terms, handling repairs and emergencies, dealing with security deposits, and filing taxes on the property. “There is always the risk that you may have to evict a tenant, which could be costly and time-consuming,” Trevizo says.